The definition of spectacle is to draw attention to oneself in public. That’s how I felt on my first trip back to Vietnam since the war. After checking into the hotel in Ho Chi Minh City, formerly known as Saigon, I decided to walk around and get a feel for the place. I’d never been there before, even during the war. My first flight to Vietnam landed in Cam Ranh Bay and from there I’d boarded a C-130 aircraft, and gone directly to the Central Highlands. During the war, Saigon had a population of half a million. Now it’s enormous with nearly nine million—that’s what happens when you “make love, not war.” That day it seemed to me that most of those nine million were on the streets, too, if not on a bicycle or motorbike, as I walked among the throng. And I certainly was a spectacle—Caucasian, and a foot taller than most. They were all in a hurry to get someplace, but many of them smiled and waved, some even yelling, “hello.” With all of the hustle and bustle, there was a friendliness that I’ve never seen in an American big city, or anywhere for that matter. A man approached me and spoke in English. Again I was caught of guard—feeling vulnerable—even afraid—but managed to nod affirmatively. I thought my eyes would pop out of their sockets. My worst fears had been manifested. 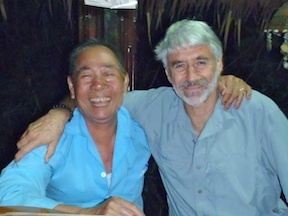 His smile was infectious, almost ear-to-ear, showing me that he was serious…and very happy to meet me, too. But, why, I wasn’t sure. I didn’t know Vietnamese people during the war. Had they always been this friendly? This man wanted to be my friend, and I was afraid of him. At one time his guts were hanging out of their confines because of American bullets. He’d almost died; maybe I’d tried to kill him. Yet now he wanted to be my friend? He should hate me. At least that’s usually the way we do it at home. And we hold a grudge, too. We don’t forgive very easily. But this guy was into forgiveness and I wasn’t sure what to think of it. Then it happened again, and again, and so many times now that I can’t even remember how many. Why do they seem to be so forgiving? Not only are they forgiving, they want to be pals. I’ve heard of war buddies, but this was taking it to extremes. We were once their enemy. I’ve now learned that this is just an example of Vietnamese culture. They have mastered the art of reconciliation, and not only within their own communities, but with their former enemies, as well.